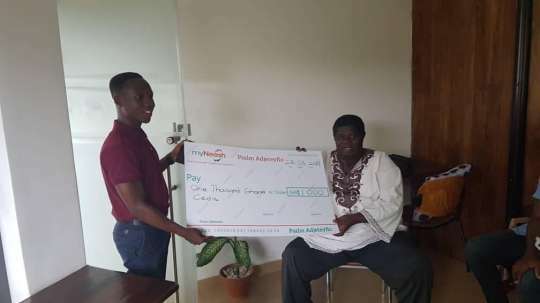 Veteran Ghanaian actor Psalm Adjeteyfio has finally received support for his heart expansion treatment after a campaign for support was started on a crowdfunding platform, MyNeesh. The actor who some time ago was reported to be dead debunked such rumors and stated that he had rather developed a heart condition that needs treatment and used that opportunity to solicit for funds to help him undergo the treatment. The Director of MyNeesh, Mr. Seyram Kofi Mantey, started a campaign to help the ailing actor gather money for his heart surgery. Well, Mr. Mantey was able to gather an amount of One thousand Ghana cedis from his campaign and has presented the money to the veteran actor who thanked him and the general public for the support shown to him. Crowdfunding is the practice of funding a course or venture by raising small amounts of money from a large number of people, typically through the internet. Through productions like ‘Taxi Driver’, TT, as he is popularly called thrilled millions and brought smiles and laughter to many.